Danger has the classic German Riding Pony pedigree elements of a significant amount (at least 37.5%) of Welsh blood plus 12.5% Arab from the Russian Arab Nalet as well as carefully selected British Riding pony lines. He is a proven international dressage pony who was 8th in the Team Test at the 2003 Pony European Championships when representing Sweden. This and other international results gives him the prestigious SPSS ELITE accolade. 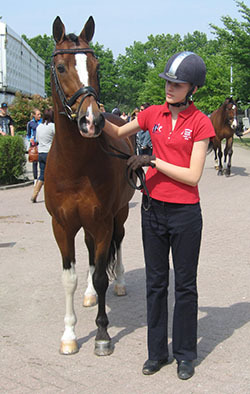 Davis Cup was 3rd at the Bundeschampionships as a 3yo then went on to win over €3,000 in dressage competitions. He is by Desteny who has both the great Premium Stallions Dandy & Valentino in his pedigree. Desteny was 4yo Riding Pony Vice-Bundeschampion & competed successfully at “S level”. Davis Cup’s dam, Jasmin is a Welsh Sec B whose ancestors include the famous Downland Chevalier. Night Lady is State Premium graded and also the dam of other successful FEI ponies & graded Stallions including Lukas. Lukas is the sire of SL Lucci, the 2013 double European Dressage Pony Individual Gold medallist who also won Kur & Team Silver medals for GB in 2014 & Team Bronze in 2013 (GB) & 2011 (DEN). 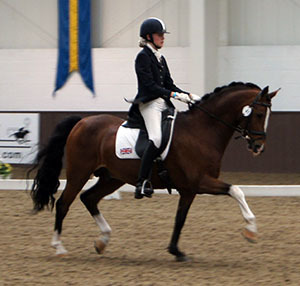 GB Team stalwart, Langar is another Lukas son winning Dressage Team Bronze in 2003 & 2005. Night-Star I was the Champion of his Licensing in 1983 and later also Champion of his Performance Test. He became the Reserve Bundeschampion of jumping ponies in 1987, and went on to produce many licensed stallions (including several licensing champions) and had many daughters awarded the State Premium title. He is the sire of the successful Eventing pony Nelusko who won Team Gold for Germany in 1996 & 2002, Individual Bronze in 1996 and Individual Gold in 2000. He is also the damsire of Donnerblitz, another GB team pony. 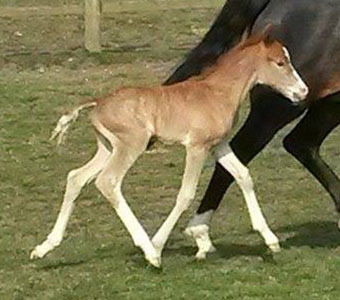 Night-Star I is considered to be one of the best sons of the sire Nalet, the purebred Russian Arabian sire who became one of the foundation stallions of German Riding Pony breeding. Danger has represented Germany and with his Swedish rider placed 8th at the 2003 Dressage Europeans! He is graded Westfälisches Pferdestammbuch and in his performance test he placed 2nd out of 39 ponies. As a 5 year old, Danger was a Bundeschampionat finalist, placing 4th in the Dressage Pony Class. He then competed successfully in Germany, before moving to Sweden. In Sweden, he was ridden by Stephanie Douglas-Anderberg and in 2003 they represented Sweden at the Pony European Championships in Necarne, Ireland. They finished 8th in the Team Test and 9th in the Individual Test. The same year, Danger and Stephanie (who got Danger when she was just 12 years old) were Swedish Champions. Danger then returned to Germany and competed internationally with Anne-Sophie Jung. Danger later came to the UK and in 2009, Chloe Vell started competing him and in July 2010 they represented GB at the CDIP at Pompadour, France and they were 5th in the consolation test. In 2011, they competed for GB at the Pony Internationals at Addington and Roosendaal (where they were 7th in the Team Test). Since his retirement from International competition, Danger has been based at Leamside Equestrian where he is still fit and active and, as can be seen from the photos on the left (and below) which were taken in February 2015, he still has a great trot and fantastic uphill canter - and he also enjoys having a jump - impressive for 21 years old. He is also enjoying hacking and being the perfect schoolmaster. Danger has only a few progeny in Germany due to his successful competition career. However, he is now available at stud in the UK and with his pedigree including proven lines for dressage, jumping & eventing is expected to suit a variety of mares. 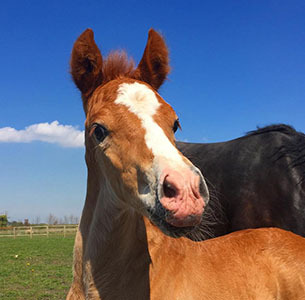 Danger's first UK foal was born in 2015 and is correct, athletic and bold with a super sweet temperament. 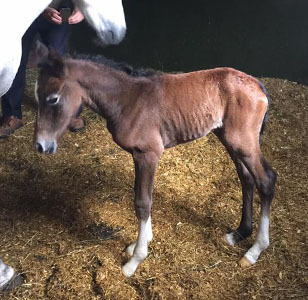 The video below was taken on his first venture outside the stable at less than 24 hours old. 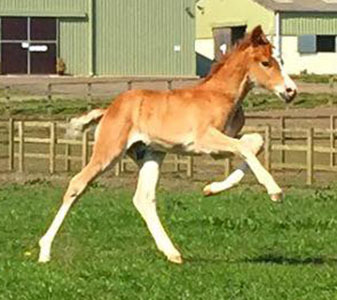 In his first years of breeding in the UK, his first since he was a young stallion (due to his competition career), Danger has excelled yet again with his 2015, 2016 & 2017 foals being identified by the Weser-Ems inspectors as potential breeding stallions & superb quality competition ponies receiving Premium awards. 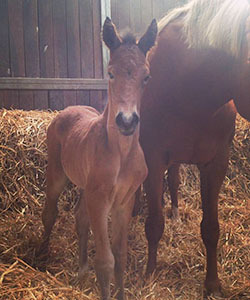 The German judges were keen to place 2016 foal, Godrics Dionysus (aka Haymitch), into the boot of their car! Haymitch is the half brother to LE Chiffre and the dam line combination with Danger is very exciting with both descending back to Night Star I. 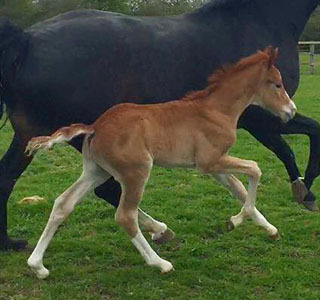 In 2017, his 2 yr old son, Godrics Decoy, was licensed by WBS-UK and a colt foal was awarded a coveted SPSS GOLD Premium. Danger 36 is now available via frozen worldwide except South Africa.